It’s that magical time of year when visions of sugar plums dance through our heads. Even as adults, we surrender to our imaginations and allow mythical lore of giving and good cheer to be perpetuated through the eyes of our children. We are compelled to provide for ourselves and children all that we enjoyed of traditions and aromas and flavors associated with the magic of the season. One such scent and taste that always sends me on a trip down memory lane is mint. Mint candy canes, mint hot chocolate, mint peppermint pillows – mint evokes powerful memories of the best times of our lives. The aroma and flavor of mint is always persuasive and compelling - enveloping us and whisking us away to the Polar climates. Enjoying foods with mint makes us feel as if a chilly wind blowing in our faces stimulating us yet tranquilizing us from daily qualms. Its scent and taste has such power that its origination is steeped in folklore. Greek mythology tells us the story of Hades the god of the underworld, who fell in love with the beautiful river nymph Minthe. Hades was already married to the lovely Persephone, the powerful goddess of both springtime and the underworld. When Minthe boasted she was more beautiful than Perserphone, the goddess showed her fury. She used her power to turn Minthe into a plant so that she would be forever trampled and crushed by those who walked on her. Hades was powerless to change the curse but was able to infuse Minthe with a refreshing and stimulating fragrance so that when she was trod upon he would be able to forever sense her presence. Of course, mint is even better with chocolate. Adding a modicum of magnificent fresh mint to the chocolate batter will steep you in two luxurious flavors that refresh and reward. A small measure of pure mint extract in real buttercream will be perfect. We don’t want to be overwhelmed with mint, but gently reminded of the joys of the season. Perfect plump mint brownies!!! Always watch your brownies carefully. Tests for done-ness are not the same as cake, you want the toothpick to come out a little wet. Carefully frost your brownies so you do not pull up the loose chocolate crust crumbs on the top. If you pile on the buttercream in several locations, you can carefully drag the buttercream one dollop into the other. I heat the recessed spatulate on the range top and smooth the buttercream surface. 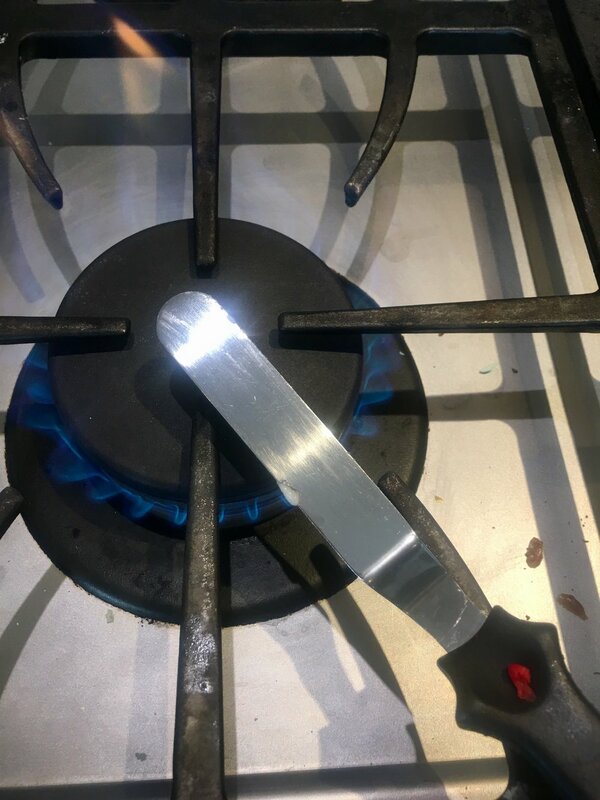 Be diligent about wiping off the blade very carefully in between each heating so you don’t have burnt sugar on your knife. Decorate with peppermint stripes. It’s easy to use Wilton’s already prepared red frosting. It comes with piping tips. Wash, dry, and chop mint leaves. Combine dry ingredients - flour, baking powder and salt. Melt butter over low heat and immediately add sugar stirring constantly until it melts. Add Cocoa powder and stir in completely. Remove from heat immediately. Add whisked eggs and water. Slowly fold in dry ingredients and mint by hand stirring until all is incorporated. Pour into buttered baking pan and place in oven. Watch carefully and remove just when toothpick inserted one inch from corner is dry. Middle should be slightly wet. Let butter come to room temperature. Using an electric mixer beat until creamy. Slowly add powdered sugar, beating on low. Add mint and beat until all is well combined. 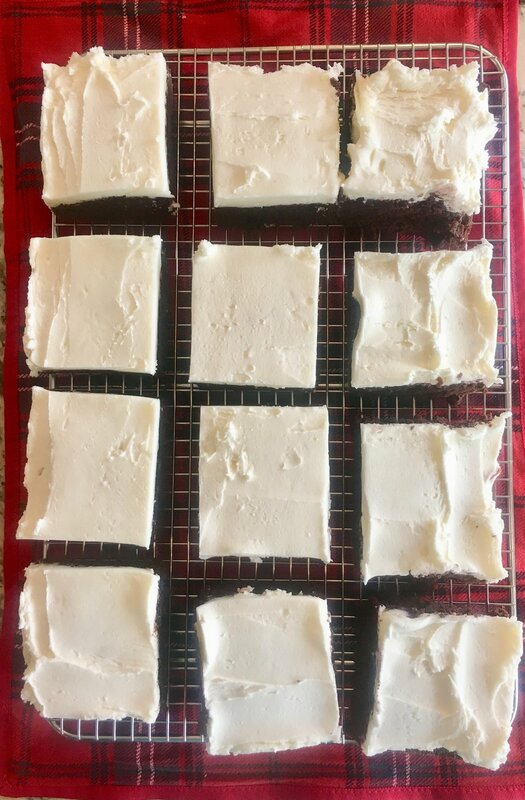 Frost brownies by placing dollops of frosting all over pan and slowly dragging together so as not to peel up brownie crust. Smooth with a knife heated over range flame. Wipe blade very carefully in between heating so as not to burn frosting onto your knife. Cut into slowly and carefully with a sharp knife. I heat it between cuts over range flame, too. I cut them into 12 large brownies for effect but you may cut them into more if you like. Place on rack and using red frosting squeeze out diagonal stripes. Keep in covered plastic container.